At our old house we had hardwood floors. In the middle of the livingroom was a large colorful rug with a cartoony map of the world. This turned out to be a bad idea. A small toy left in the middle of a wood floor is immediately apparent. A small toy against a colorful cartoony background blends in and invites many twisted ankles to the party. 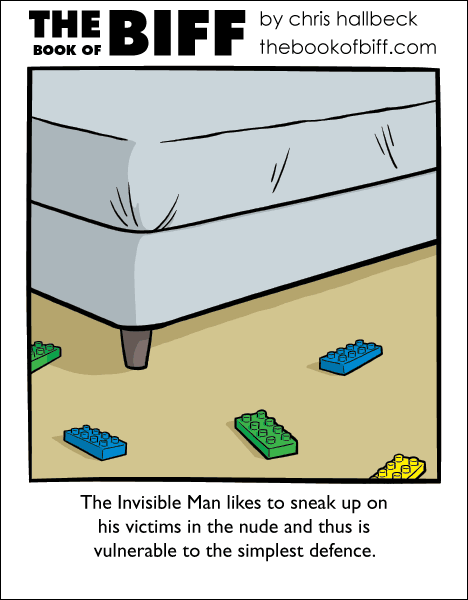 What if the invisible man would go streaking? If you’re aware of his presence, and reasonably sure of his location, pointing and laughing works really good, too.